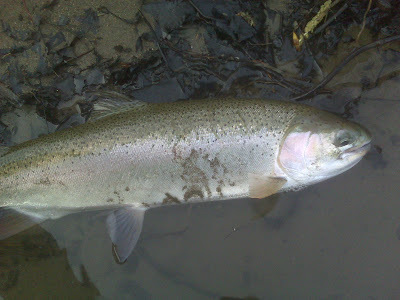 With yesterday's rain and a drop in the temps yesterday and into today, I had a feeling there would be some fish to be had. There was a nice bump in the hydro graph over night so I was on the Catt at first light. 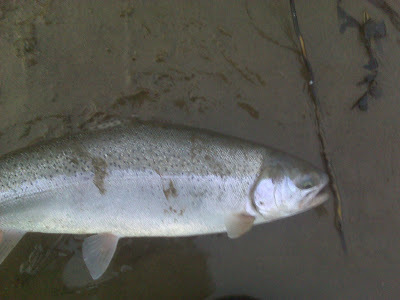 There was still good visibility in the water accompanied by a very nice flow. The best part of the morning is that it slowed down the aggressiveness of the bass bite and kept them off the line. I only caught 5 of those things today. 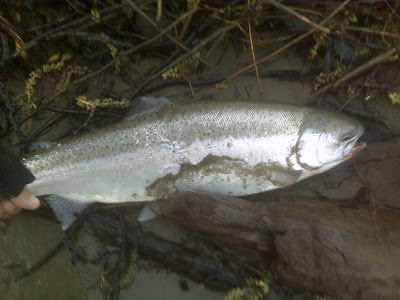 This morning the steelhead were hungry for jigs in various colors and pink worms. I didn't try roe but I am sure it would have worked. After the first half hour I met up with Jerry and Magic Mike and they did their thing. I cut it short after about three hours as I was having wicked line twist. So I am off to Gander to get new line and I guess I will have to play like the other kids and use a swivel above my float in addition to the one connecting my main line to the floro. Gee in the old days I would blood knot all my connections and don't remember so many problems. I am off for new line as there was no tolerating the twist and finishing of the morning. Nice to see that there are still some available, Joe. And just think Bill I have not even touched your secret spot. all my fishing has been lower on the system. Hope your not pinning for tarpon or snapper while the wife naps! Now that sounds appealing. Sign me up. I have seen on You Tube pinning for Stripers.